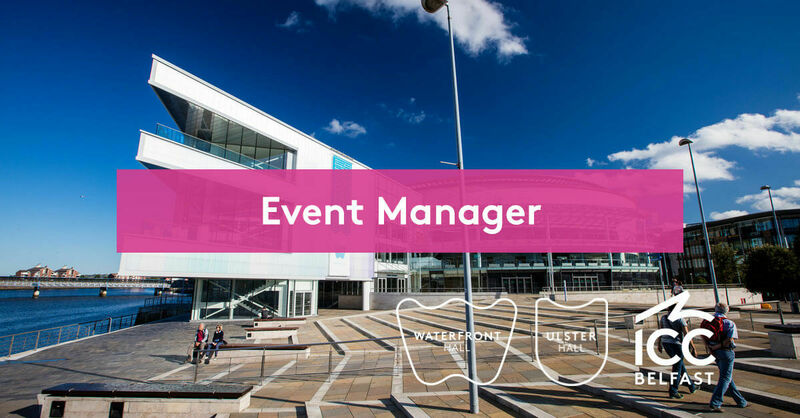 We are currently seeking to recruit an Event Manager on a one year full time contract, who will be responsible for the planning, management and delivery of all operational and relevant financial aspects of assigned events within Waterfront Hall and Ulster Hall. A full job description can be downloaded at the bottom of this page. Hours of work: Your hours of work are on average 37 per week over a 4 week period. The Company reserves the right to amend working hours or change rosters at any time to meet business/client requirements and will give at least 72 hours’ notice. The rota will include a mixture of days, evenings and weekend working five days over seven. The innovative creative planning and delivery of events to exceed client expectations. The effective, efficient planning and delivery of activities and services associated with the hosting of events. The achievement of all financial targets including secondary sales and the efficient delivery of services within budgets. To be able to work flexibly across the two venues of the BWUHs to ensure the necessary high standards of service delivery are achieved. On occasion to represent the Head of Event Operations and Lead Event Manager in the post holders sphere of responsibility. To be the main point of contact throughout the planning and contracted period of each allocated event. To apply for this post, please send a comprehensive CV that details your relevant qualifications, experience, and work history along with a covering letter outlining how you meet the essential and desirable criteria for the role and monitoring form to: hrinbox@waterfront.co.uk or by post to: Human Resources, BWUH Ltd, Ulster Hall, Bedford Street, Belfast BT2 7FF. The closing date for application is Tuesday 10 May 2019 at 12.00pm.